Welcome to Om Nom Nirvana, a blog that seeks spiritual satiation through food, health, wellness and travel. Come away with me as I traverse through life in the sandpit that is Dubai and occasionally take a break with me as I vacation (or do a famous UAE staycation) in different places all around the world. The first aspect of my blog is directed at health and wellness. The main reason beyond this was that I needed to take my health seriously. In 2011, I was diagnosed with Hashimoto’s disease, a condition of hypothyroid where my body attacks the thyroid gland. This means my metabolism struggles (and I gotta admit, my food habits don’t help either). I’m actually supposed to stick to eating non-processed, gluten-free,sugar-free food. Which if I did follow, would make me really upset because as my cousin Poushali says, ‘CAKE IS BAE.’ Later, in 2017, I was also diagnosed with PCOS (Poly cystic ovarian syndrome). I’m all about fighting the good fight and I’d like to take you on this journey to getting healthier with me. 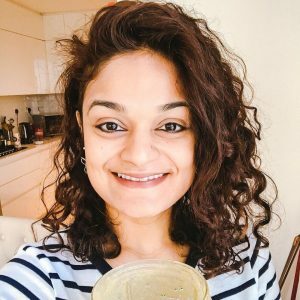 🙂 I recently reached a healthy weight (read my story here) and would love to share my journey fighting Hashimoto’s & PCOS with you. I enjoy yoga, dancing, various group training exercises and meditation. I also review the occasional spa and occasionally interview professionals from the wellbeing and mental health history, because health is not just physical. I have lived the majority of my 28 years in Dubai and it is truly home to me. During the other years, I’ve spent living abroad in India, the U.S.,U.K. and Malaysia where I began to develop my palate. Being exposed to different cuisines since childhood (and mostly because of eating food all my life like most people), I truly enjoy reviewing restaurants and discovering new cuisines, but now I’m shifting my blog focus towards healthier eats. Ah, travel! It stirs the soul. I’m all about journeys and slow travel. And so far, I have accomplished it! I’ve visited 28+ countries so far (but, hey, who’s counting?) and don’t ever plan on stopping. Check this space out on how to eat healthier and access a lovely bunch of itineraries. This UAE-licensed blog abides by word of mouth marketing standards. We believe in honesty of relationship, opinion and identity. The compensation received may influence the advertising content, topics or posts made in this blog. That content, advertising space or post will be clearly identified as paid or sponsored content. The owner(s) of this blog is occasionally compensated to provide opinion on products, services, websites and various other topics. In this case, we always give our honest opinions, findings, beliefs, or experiences on those topics or products. The views and opinions expressed on this blog are purely the bloggers’ own. Any product claim, statistic, quote or other representation about a product or service should be verified with the manufacturer, provider or party in question.